Preface: Participants of the inaugural Sarajevo Symposium were asked to participate in a day-long capstone simulation. All participants were presented with a fictional scenario of Bosnia and Herzegovina, five years in the future, facing a growing youth movement and a European financial crisis. Aiming to address the concerns of the youth movement and move towards EU ascension, the governing bodies of Bosnia and Herzegovina have agreed to a constitutional assembly to rewrite the current constitution, established in the 1995 Dayton Peace Accords. Participants were assigned roles, representing major political and ethnic groups of Bosnia and Herzegovina, to form delegations at our simulated constitutional assembly. 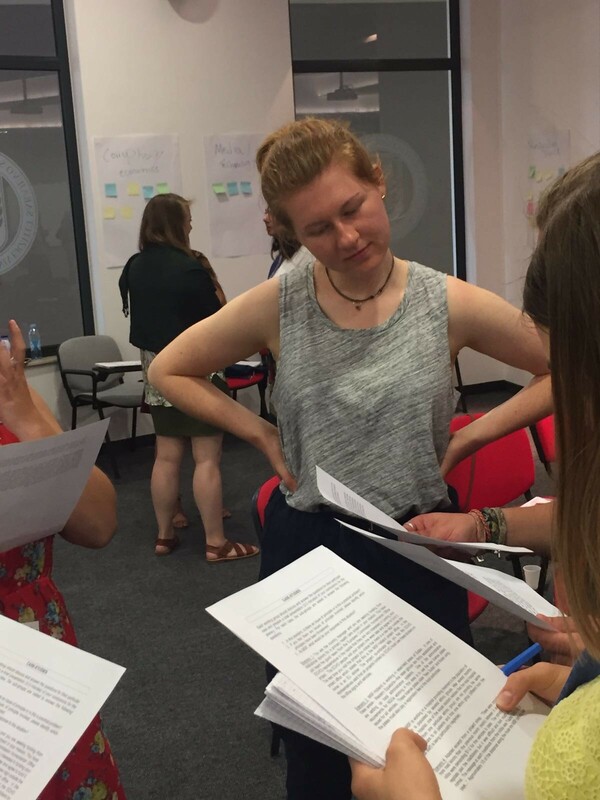 Participants were asked to balance what they have learned about post-conflict transitions, the assignment to establish a new Bosnian constitution, and the competing interests of their assigned roles. For the entire duration of Thursday, the Symposium participants were given the incredibly daunting task of rewriting the Constitution of Bosnia and Herzegovina (BiH). In preparation, we had been treated to a talk by the Bosnian component of our group, outlining the incredibly complex governance system in BiH comprised of state, entity, cantonal, and municipal levels. Despite the knowledge of our local participants, many of us were confused by the governance system in BiH and left the talk with more questions than before we began. We could immediately see that the system was far from perfect, and it made us excited as we anticipated the day to come. For the simulation, each individual participant was given a personality or history which fit into one of five delegations for our Constitutional Assembly. There were Bosniak, Croat, Serb, Bosnian Youth Movement, and Minority group representatives. Within each delegation there were variances as to different aspects of their identity which may change their stance on various issues—e.g. some participants were notified they are the children of parents from two different ethnic groups. Some of the information we were given was confidential, and we couldn’t reveal the motives behind our actions, which seriously complicated matters. Right from the very beginning, it became fairly clear that the participants representing the Serb delegation were going to take a very hard line on maintaining their autonomy through the entity of the Republika Srpska, something which many of the other delegations would have been happy to abolish. Little actual negotiation was able to take place due to this hard stance, and after substantial debate, the notion of dissolving the entities was given up. The Croat delegation received support from the Serb delegation for creating a fourth entity for the Croat population, but this was met with great resistance from the remaining delegations and was not successful. However, there was unanimous support for the abolishment of the cantons in one entity, the Federation of Bosnia and Herzegovina, as this additional layer of government seriously complicated the system and added substantial costs of running the government. A major concern for many of the delegations was the fact that minorities are currently unable to run for the position of President. There was great support for altering this situation, but it was difficult to resolve without some compromise between the delegations. As this coincided with little support for retaining the three-part presidential system, the two were combined, and the system that emerged resulted from a combination of proposals from all delegations. It was decided that the presidents of the two major entities, voted for by their own entities, would serve as the vice presidents to the singular president of the entire state of Bosnia and Herzegovina. The state president would be democratically elected by the entire population of the state. Any individual with permanent residency would be eligible to run for president, regardless of their ethnic or religious background, and any citizen with permanent residency would be allowed to vote in presidential elections. This represents a major step forward for improving the position of minority peoples in BiH, and for simplifying the incredibly complex system of government in this state. Another incredibly important issue was how to reduce the ethnic division that occurs within government in BiH. A proposal was put forward in which any political position could be occupied by any person regardless of their ethnicity or religion, and that a political campaign could not include reference to ethnicity or religion, but instead elections and campaigns would be based on political ideology. This would be a dramatic change from the current situation, in which individuals from the entities can only vote for those running of certain ethnic groups, and that limits who can run for which positions. In this manner, we envisage a BiH in which ethnic distinction and conflict is dramatically reduced, and where equality between all ethnic groups, including minorities, is much closer to being achieved. A proposal along these lines, amended extensively by the Assembly, and was eventually passed. A resounding cheer went up amongst the delegations after the previous relatively unproductive morning and early afternoon. In the end, we created a model for the Constitution of BiH in which ethnic conflict was not at the forefront of politics, leading to greater equality between those of all ethnic groups including achieving representation for minorities and greatly reducing the complex and costly structure of governance in BiH. It was an incredibly challenging experience, constantly negotiating between five delegations with competing interests, but being able to produce something substantial in the end was incredibly rewarding and may go some way to instilling hope in the youth of Bosnia and Herzegovina that a better way exists for the future.